Please click on the following link for details! The 2016 annual Viking May Cruise is set to take place May 20 to 23. This year we will be three boats, including Freya, with room for only 16 persons. We will be departing from Nanaimo and heading northwest of the Gulf Islands, first to Tribune Bay on Hornby Island, then on to Schooner Cove, and finally back to Nanaimo. This gives us a beautiful anchorage and beach area for the first night and the second night at the marina in Schooner Cove. Make your way to Stones Marina in Nanaimo (it’s roughly a ten minute walk from the Ferry). Boats will be available to board between 16:00 and 18:00. Once your gear is stowed join your fellow Vikings at Carlos O’Bryan’s Pub. Supplies are available at a Save On Foods, a five minute drive or 20 minute walk away. There is a liquor store at the same location. We’ll depart first thing (the earlier the better) and make our way up to Tribune Bay at the south end of Hornby Island. This is about a 35 NM sail up to Tribune Bay where we will find one of the loveliest sandy beaches in BC. A one km beach know as “Little Hawaii”. Take time for some hiking, swimming, photography or just lazing on the beach. Weather behaving as it should we should have a wonderful 25 NM run down to Schooner Cove Marina. Here we can take advantage of the restaurant, free power and water, showers, laundry and free Wi-Fi for Shaw customers . Eat on board or not – your choice. Showers are highly recommended! It’s time to head back to reality with a 14NM leg to Nanaimo – hopefully with the wind at our backs the entire way. We’ll aim to be back between 15:00 and 16:00, giving you a chance to make either the 17:20 or 18:30 return ferry to Horseshoe Bay. The cost is $350 for members and $385 for non-members. We are putting fewer than the maximum per boat to make life aboard a little more comfortable. The May Cruise Planning Meeting will be held at Jericho (Northwest Room) on Wednesday, May 11, 2016 at 19:00. We are a teaching club and in the past everyone who wanted got a chance to take the helm. However things have changed. In 2009 the Federal Government introduced new licensing requirements which require anyone in control of a boat with a motor (whether it’s on or not) to have their Pleasure Craft Operator Card (PCOC). If you don’t have one, there are plenty of opportunities to take the exam in the spring. Please consider getting yours before the cruise. The charter company has the same rules as last year with regards to linens – they do not outfit boats with bedding for charters of less than a week. This means you need to bring your own pillows and bedding, or chose to pay their fee of $30. The option in available in the sign-up form below. If you chose this option please include this cost in the total of your cheque. You can reserve your spot by filling out the form at the bottom of this document and mailing it in with your cheque. Cheques can be post-dated to April 15, 2016. Reservations are on a first-paid, first-reserved basis with a total of 16 spots available. Act early to avoid disappointment – the May Cruise always fills up. New members are especially welcome. No previous sailing experience is required, and you don’t need to know anyone – just sign up! 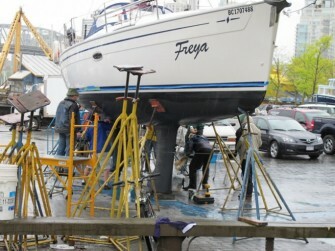 Freya will be hoisted out of the water on Friday, April 15 and stationed within the Granville Island Boat Yard for her annual maintenance. The work party begins on Saturday and continues through the weekend. This is a great opportunity to learn more about our beautiful cruise boat and the work necessary to keep her on the water. It is also an opportunity to connect with your fellow club members! Plus, the more volunteers we have the faster the work will be completed. Questions/RSVPs to Val (Flotilla Captain).